This new version of IconWorkshop™ includes a feature to compile Icon Libraries as install package ready for distribution. Additionally, a feature has been added to force the user to enter an activation code to proceed with installation (optional feature). Before reading with this topic, you need to know how to compile an Icon Library. Click here to read the related topics if necessary. 1. Based on the User Name: The user must enter its name and the activation code using this format: 1234-1234-1234-1234 (4 groups of 4 digits). • Pro: The user has to provide his name if he wants to publish the code. • Con: The author has to manually generate a code for each user. • Pro: The author can automatically generate a list of codes. • Con: The user can anonymously share his code on Internet. 2. Click to check the option "Use an Activation Code" ( ). The whole dialog box enables. 3. In the Icon Library ID zone ( ), you see a large hexadecimal number. 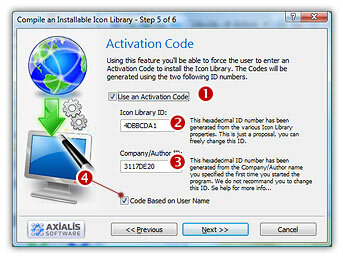 This ID will identify your Icon Library (used during activation code generation and verification). This is just a proposal based on your Icon Library properties. 4. In the Company/Author ID zone ( ), you see another large hexadecimal number. 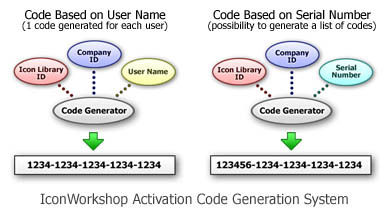 This ID will identify yourself or your company (used during activation code generation and verification). This is just a proposal based on your Company Name properties. 2. In the Library ID ( ) and the Company ID ( ), enter the hexadecimal numbers you entered at compilation for the requested Icon Library. If you can't recall these numbers, click on the "Get IDs from History File" button ( ). A dialog box opens, displaying a list of the compilation you have done, select the right line then OK.
2. 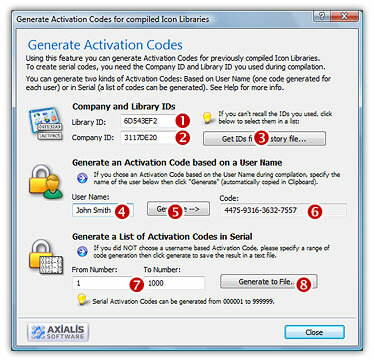 In the Library ID (see above ) and the Company ID ( ), enter the hexadecimal numbers you entered at compilation for the requested Icon Library. If you can't recall these numbers, click on the "Get IDs from History File" button ( ). A dialog box opens, displaying a list of the compilation you have done, select the right line then OK.
3. In the From and To Number zones ( ), enter the first and the last number of the list of codes to generate. When done, click the "Generate To File" button ( ). A standard Save As dialog box opens. Select a location and a new filename (TXT). When done, click OK. The file is generated.